Whether your child is overweight or not, healthful eating and exercise are keys to personal well-being. As a parent, you can take an active role and guide your child in the right direction to grow and pursue good health for a lifetime. “Savor” is a word we sometimes use to describe taking time to enjoy the aromas and tastes of a delicious meal. It means to slow down and appreciate the moments we enjoy with foods that taste good. 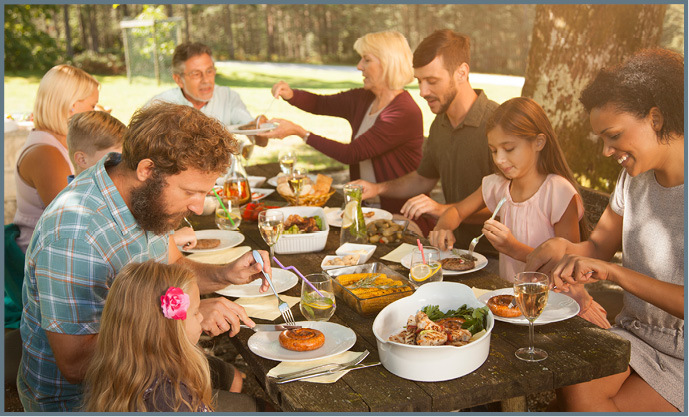 But savoring also can apply to the family moments that surround family meals. Family mealtime used to be the foundation of everybody’s day. Studies show that about 40 percent of families eat together less than three times a week and 10 percent do not eat family meals at all. Studies have shown that families who eat together often choose more nutritious foods, such as vegetables. Dinnertime is a perfect time to teach your children about healthful eating. Sometimes, the only time that families really get to spend with each other is when they’re eating together. Tonight, ask each family member to share his or her daily events. Research shows that children get more than just nutritional education and family time when they eat dinner with their family. Children have more self-confidence, get better grades and are more active in school-based activities. Your 15-year-old may have lots of homework to do, you may have a car to fix and you need to help your first-grader with her spelling words. That doesn’t mean you still can’t make every moment count when enjoying dinner with your family from now on. Check over everybody’s schedule for the week. Try to schedule dinnertime when it works best for the whole family. Focus on making simple meals that your family really enjoys. Get the rest of the family involved in making meals. You’ll get to work together and spend good-quality time with each other. Minimize distractions. Turn off the TV, cellphones, games and other distractions. Let your phone take a message for you. "Grandma always had a big bell by the back door. She'd ring it 10 minutes before supper. When that bell rang, working was done!" Question: I was a single mom until just last month, and my son and I rarely ate dinner together. He ate in front of the TV. Now, our new family is eating together, and I see that he has no manners. What can I do? What should I teach him? Children need to be taught manners, especially for meal interactions, because they don’t learn these skills all by themselves. Research has shown that when children are taught manners at an early age, they will be more confident and comfortable when in public situations. Eating together as a family is a great way to begin teaching your son manners. Remind him to say “please” and “thank you,” close his mouth when he chews and avoid speaking with his mouth full. Using a knife and fork together takes skill and practice, so serve as a role model for these skills and guide his efforts with patience. Focusing on these few “good behavior” habits will be very helpful to your son. You can expand to other lessons in manners after he begins to make progress with a few basic guidelines. Quick Tip: Try to steer the conversation toward positive discussion at the dinner table. Allow each person a chance to talk. This makes dinnertime more enjoyable. Preheat oven to 350 F and grease a 9- by 13-inch baking dish. Lay the chicken pieces into the dish and lay slices of cheese on top of each piece of chicken. Next mix the soup and milk in a bowl and pour over the chicken. Sprinkle the stuffing on top of the casserole. Cook uncovered for one hour or until a thermometer in the chicken reads 165 F.
Each serving has 210 calories, 10 grams (g) fat, 22 g protein, 8 g carbohydrate, 1 g fiber and 210 milligrams sodium. "Eat Smart. Play Hard.” is an initiative of the Food and Nutrition Service, U.S. Department of Agriculture.